It seems this happened. Chances are high it was just for the TLC show and isn't real. But it doesn't matter. It's trash-tastic all the same. I'm not even embarrassed to tell you that I often watch Downton followed by Honey Boo Boo. They balance each other out. 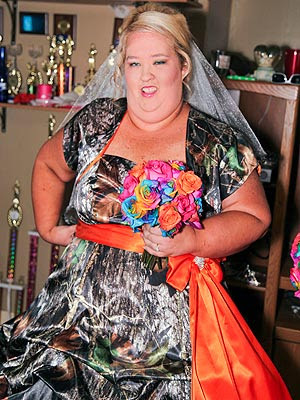 Is that a camo print wedding gown? Oh, KK, please put that in your idea bank for future!